Art never can reach the sublime. Art can only be the trace of the absence of the sublime that is nowhere to be seen. Therefore, art cannot be an artifice. True art is unencumbered by itself or by its own expression. 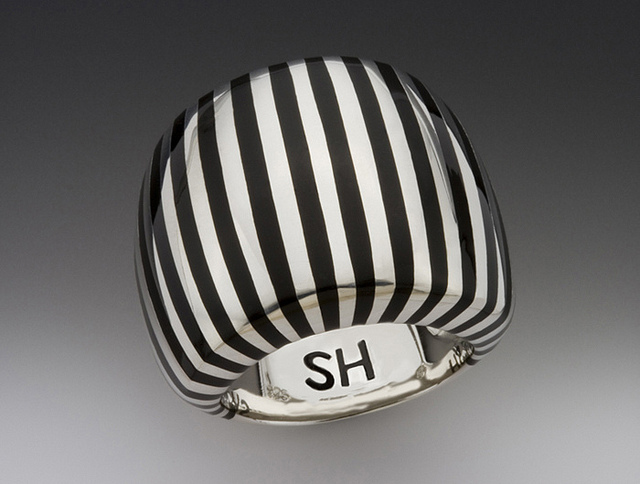 Sean Hill has been designing and making his own jewelry since 1998. Entirely self-taught, his background is mostly scholarly, teaching and publishing a book on Critical Thinking for more than 20-years, he has his Ph.D. in French Literature. For years, Hill worked mostly on big silver sculptural one-of-a-kind pieces, using precious stones, shells, and fossils. Later he decided to turn his work into a less traveled area of jewelry making. After years of trial and error, with various brands of new high-tech Epoxies and Bakelite, he finally created a line of silver jewelry inlaid with a bright and colorful Gem Grade resin. Over the past three years, Hill has added gold to his collection and has started a separate line in 18K and diamonds. Each and every one of his gold pieces are fabricated. He does not use any lost wax or casting techniques. Every piece is unique, handmade and slightly different whenever repeated. Art pieces jewelry must remain as timeless, beautiful adornments that complement and enhance the body; they cannot be full of themselves or so arcane that they become disconnected from their true purpose.